Click on the stain and HemoSpat uses image recognition techniques to approximate the ellipse. 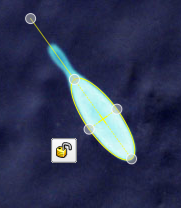 If it needs to be adjusted, use the ellipse control points - a couple of clicks with the mouse and you're done. As the analyst, you maintain control over how the ellipse is fit to the bloodstain. Optional guidelines will show you the box around the ellipse selection to help you fit the ellipse to the bloodstain. In order to increase the contrast between the bloodstain and the background, it is sometimes useful to invert the colours in the image. Enter your stain names and locations quickly using the Quick Entry window. On the left, the current working image of the stain you are editing is shown. On the right is the table where you can tab through and quickly modify the name and location data for each stain. 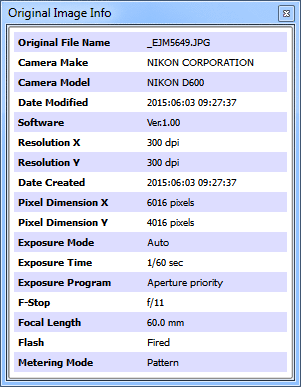 Digital cameras often save additional information about the photos, called EXIF data, in the photos themselves. This includes data such as the camera make and model, when the photo was taken, and if the flash was used or not. With HemoSpat, you can see this information if it is available. 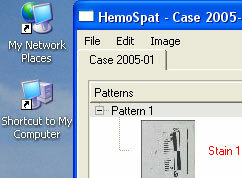 HemoSpat saves all the analytical work done by the user. Should you see a problem with one of your strings, it is a simple matter to pull up the individual stain and look at the ellipse, plumb, and scale placement. This also allows for a proper peer evaluation because the evaluator will be able to see all the work that went into generating the final result. 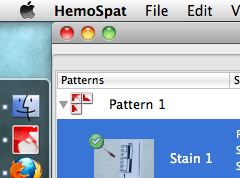 HemoSpat supports the analysis of more than one pattern at a time and includes several ways to import your digital images into the project. Simply drag your images to the window to add it to a pattern or create a new one. Moving stains between patterns is as easy as dragging the image from one pattern to the other. 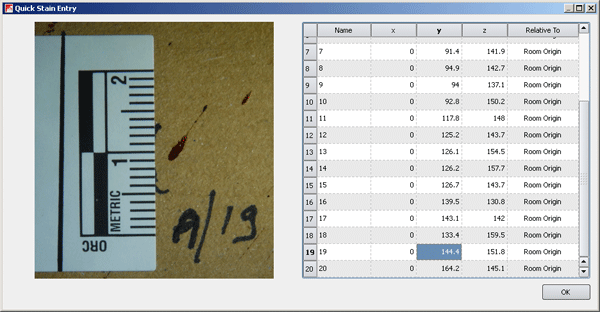 Once the main stain in a reference photo has been analyzed, you may identify and use any other bloodstain in the photo. This speeds up the documentation process, allows you to use more stains, and allows peer review of the stain selection process. 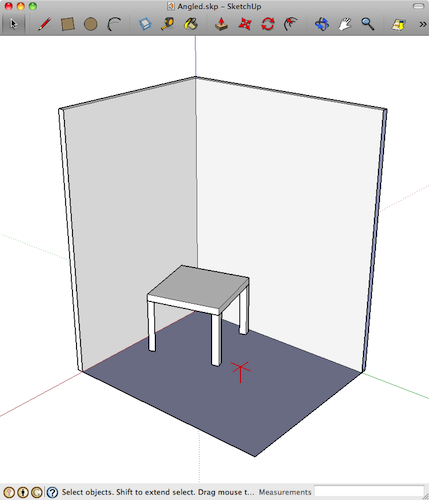 HemoSpat has an easy-to-use surface editor that allows you add any flat (planar) surface to the scene for your analysis. These surfaces may be exported to your crime scene reconstruction software to give you a framework to start from or to double-check that everything lines up properly in your model. To make the measurement of stain locations on angled surfaces easier, HemoSpat introduced the concept of relative stain locations. 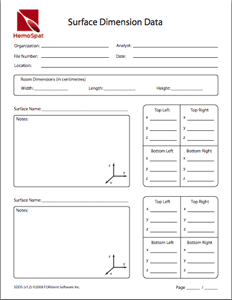 This	allows you to measure the stain locations relative to the surface's bottom-left corner, greatly simplifying the documentation process and saving you a lot of time. The area of origin is calculated in real time for each pattern. 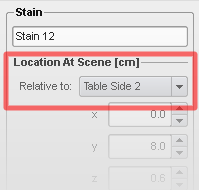 This means that as you change your stain data, the origin is automatically recalculated and the 2D views updated. 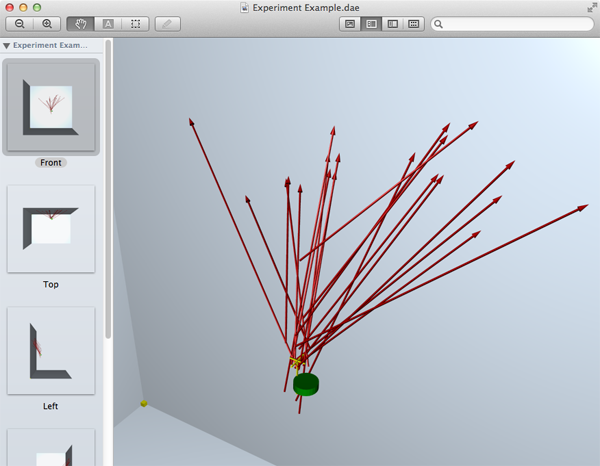 Export the data at any time to see a snapshot in 3D. 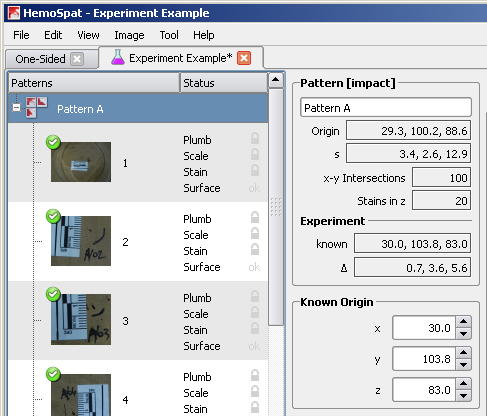 If you are conducting an experiment and you know the origin of the impact pattern, turning on Experiment Mode lets you specify the known origin for the impact pattern. HemoSpat will use this to calculate and display the delta against the calculated origin. 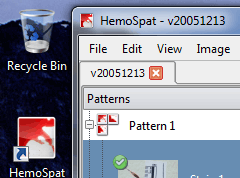 The known origin is optionally included when using HemoSpat's 2D Viewer. 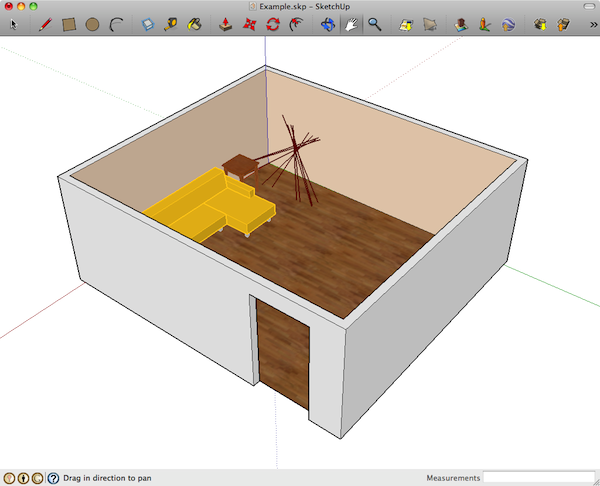 If you export to any of the 3D formats to view your scene in Apple Preview or SketchUp, you can include the known origin in the 3D diagram as well. HemoSpat stores its data and the analysis in the project. It is, however, your data and you should be able to use it however you like. You should not have to manually enter this data again into other software for further analysis. Your data may be exported in various formats for reports, directional analysis using other software, or for use in crime scene reconstruction. 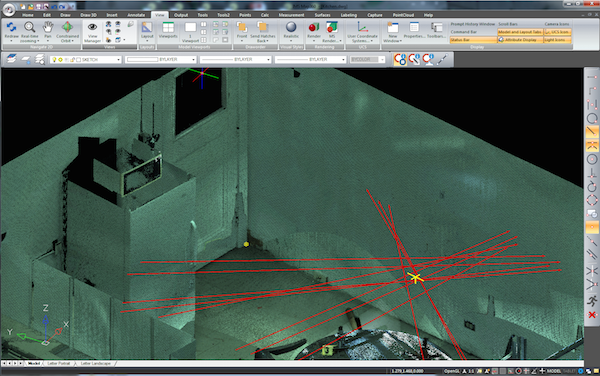 * DAE and DXF files have been verified by MicroSurvey Software to work with MapScenes & IMS Map360. 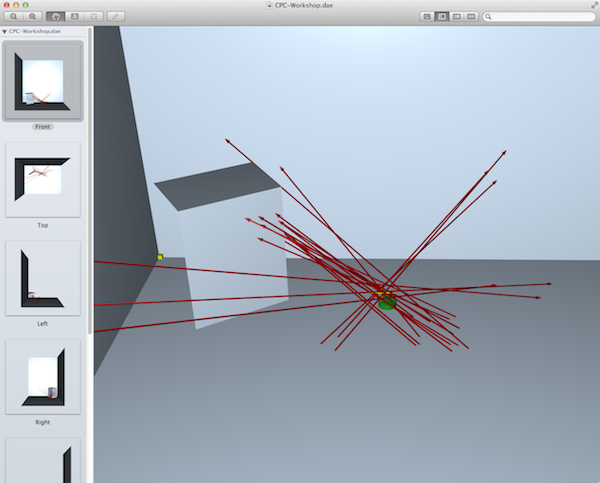 ** DXF files have been verified by The CAD Zone to work with The Crime Zone. We can also provide custom exporters for other formats if the details of the format are available. 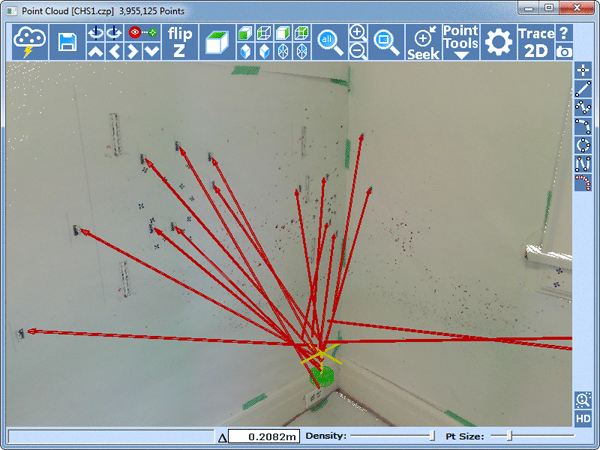 HemoSpat provides tutorials on how to integrate your bloodstain pattern data with point clouds using software such as IMS Map360, CloudCompare, and CZ Point Cloud. 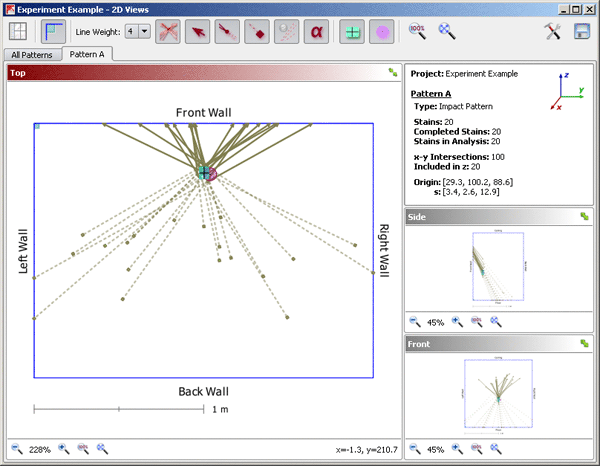 HemoSpat also provides tools and tutorials to integrate your bloodstain pattern data with other 3D software such as SketchUp and The Crime Zone. 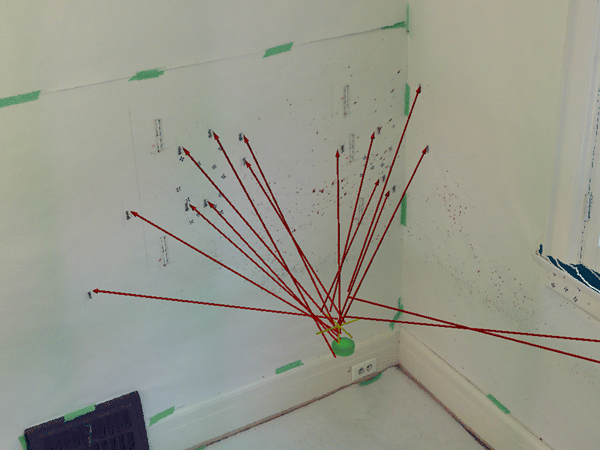 Traditionally, the 3D coordinate system used in the field of bloodstain pattern analysis to record bloodstain locations is the right-handed coordinate system. For some people, however, the 'x' and 'y' axes seem "backwards" because they visualize 3D space in terms of the left-hand coordinate system. 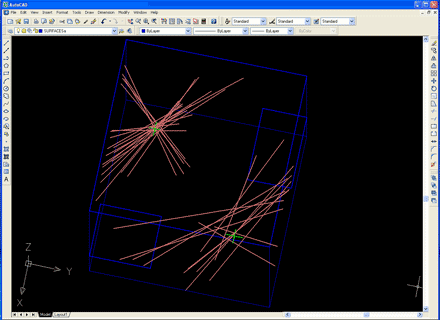 HemoSpat lets you choose which coordinate system you want to use. 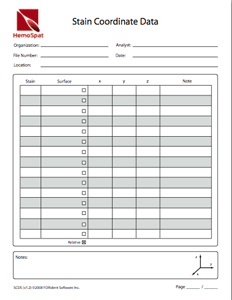 We provide forms to be used at the crime scene for recording bloodstain location information and surface information. 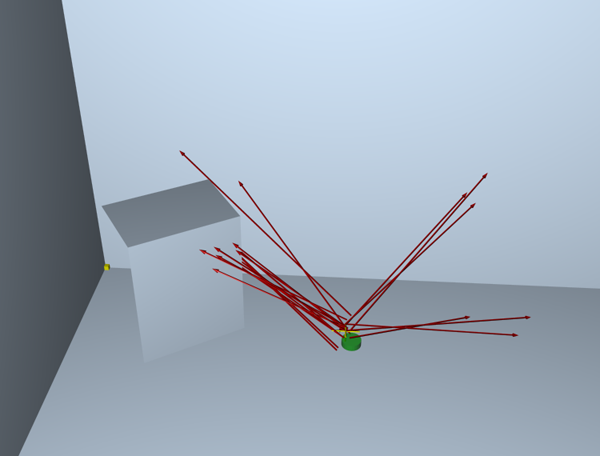 They are laid out according to how the data is input into HemoSpat when analyzing a scene. These may also be filed with your case paperwork for future reference. HemoSpat is available for macOS 10.11-10.12 (64-bit Intel), and Windows 7/8/8.1/10.